18 December: Doing Business with Mongolia seminar and Christmas reception. 18:00-21:00. Hosted by Ernst & Young, London. Speakers included: Craig Kinnell, President and CEO Oyu Tolgoi (tbc); Kirsten Livermore, Former Australian MP;Tom Kendon and Helen Eccles of Cambridge Assessment. Jane Isaacs, Association of British Mining Equipment Companies: Impressions of Opportunities in Mongolia Gained from Trade Missions. UKTI ran its third five-day seminar mission to Ulaanbaatar to showcase the best of UK manufacturing, skills and expertise in the construction equipment and mining sectors. It was delivered by the Construction Equipment Association (CEA), giving UK companies a platform to present their products to an audience of around 75–100 targeted Mongolian delegates of equipment end users, government representatives, mine operators, developers and owners, contractors and equipment distributors with 30-minute formal presentations followed by a networking lunch and one to one meetings with delegates. The rest of the week was taken up with group visits and individual meetings. 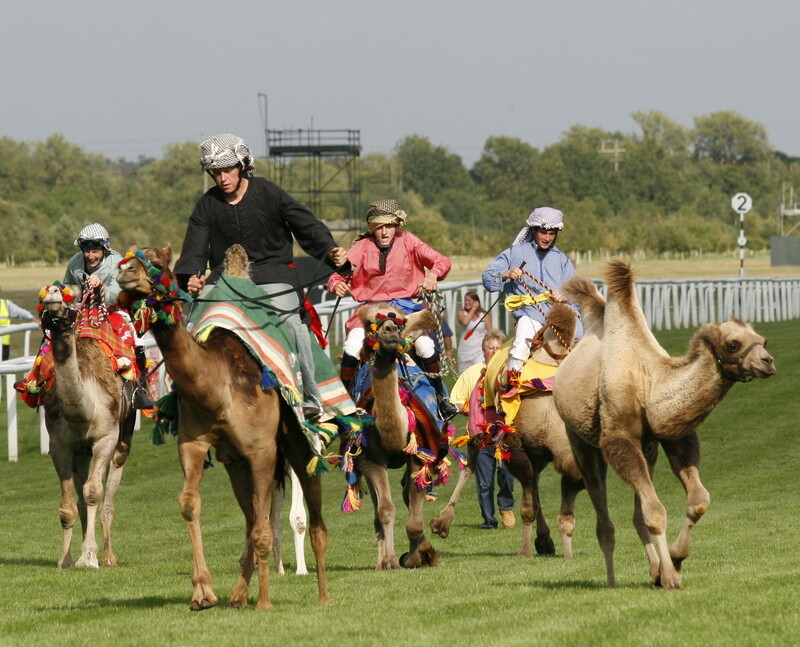 This fundraising afternoon at Hole Park in Rolvenden, Kent, was organized by the Wild Camel Protection Foundation to protect the wild double-humped camel. 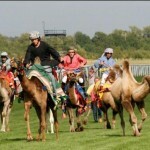 Activities included camel racing and camel rides, Mongolian wrestling and musicians. We hope for a fuller report on the event soon. A lively crowd showed up for the launch of John Man’s book The Mongol Empire at the Brunei Gallery Lecture Theatre, School of Oriental and African Studies. John used the occasion not only to launch his impressive new book, but also to publicize a project that he and others (including the Mongolian Ambassador to the UK, His Excellency N. Tulga) are working on: the creation of a Mongolian Studies programme at SOAS. The evening included music by the Mongolian Khöömii Overtone Singers. 5 June, 18.00-21.00. Doing Business with Mongolia seminar. Blue Sky Tower, Ulaanbaatar. The Mongolia Trade & Commodity Finance Conference returned to Ulaanbaatar in May 2014 for the third edition of this annual series, the only such event for the Mongolian trade and commodity finance community. Held in the Inter-Parliamentary Union room at Westminster Hall, this event provided an opportunity for members of the Mongolian British Chamber of Commerce to meet with MPs in the All-Party Parliamentary Group on Mongolia. Event Organiser: UK Trade and Investment. This UKTI Birmingham-led visit aimed to get British companies tapped into the rapid growth that is forecast for Mongolia during the coming years. Opportunities in agriculture, construction, professional, financial and business services, education, and tourism are rapidly developing for UK business. Ushering in the Year of the Horse, this seminar took place at PricewaterhouseCoopers at 1 Embankment Place, London. A full description of the evening is described here. The speakers were Carolyn Clarke, PWC; Stephen Tricks, Clyde & Co LLP; John Digby-Rogers, Investment Capital Ltd; John Man, Historian (author of Genghis Khan: Life, Death and Resurrection); Paul Watson, Football Coach, Bayangol FC. A drinks reception followed the seminar to mark the Mongolian New Year, Tsagaan Sar (White Moon). This webinar provided a platform for UK companies to ask questions directly from speakers. Main Contact: Elbegsaikhan Ayush. Tel: +976 (11) 458133 (2024) Email: Elbegsaikhan.Ayush@fco.gov.uk. The 3rd in the series of Ulan Bator Burns Suppers on Saturday 11th January 2014 brought to an end in Mongolia celebrations of 50 years of Mongolian British Diplomatic Relations. This was organised by David Scott, the Honorary Consul of Mongolia in Scotland in association with the Chamber. KPMG was the principal sponsor.